In mid-17th century France, the rapier was greatly reduced in length and weight, leading to the development of the weapon that we know of today as the small-sword. Although having its origins in the Italian school, the French masters were able to develop a school of fencing that took advantage of the greater facility and ease of handling of this new weapon. They also devised a different manner of gripping the sword. 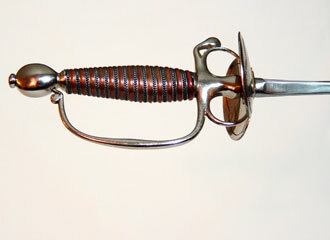 The French school emphasized blade-to-blade contact, which cultivated tactile sensitivity (sentiment du fer) to a level that could not have been possible with the earlier longer heavier rapier. Instruction adheres to the teachings of the French Academy of the 18th century, with particular influence from Le Sieur Wernesson de Liancour (1686), Le Sieur Labat (1690) and Domenico Angelo (1787).